The example in the section Aspects of Semivariogram Model Fitting in the VARIOGRAM procedure investigates fitting of a theoretical model to describe spatial correlation in a study of 138 simulated arsenic logarithm concentration (logAs) observations. These observations form the logAsData data set, which is treated as actual data for illustration in the examples. 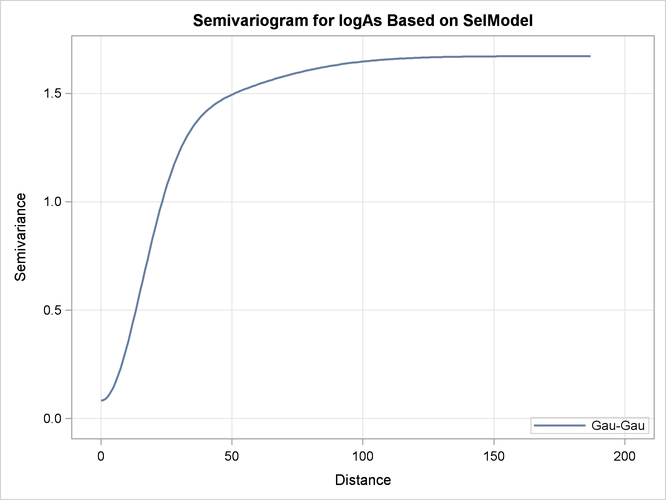 In this example, you use the logAsData data set and the semivariogram analysis results to predict the logAs variable values across space in a specified square region of size 500 km 500 km. Your goal is to answer scientific questions in your analysis by means of your prediction results. This application highlights the impact of the correlation model choice on predictions. The example in section Investigating the Effect of Model Specification on Spatial Prediction examines additional aspects of this impact. The World Health Organization (WHO) standard for maximum arsenic concentration in drinking water is 10 g/lt. Assume that you want to answer the following question: In what percentage of the study area does the Arsenic concentration exceed the WHO regulatory standard? 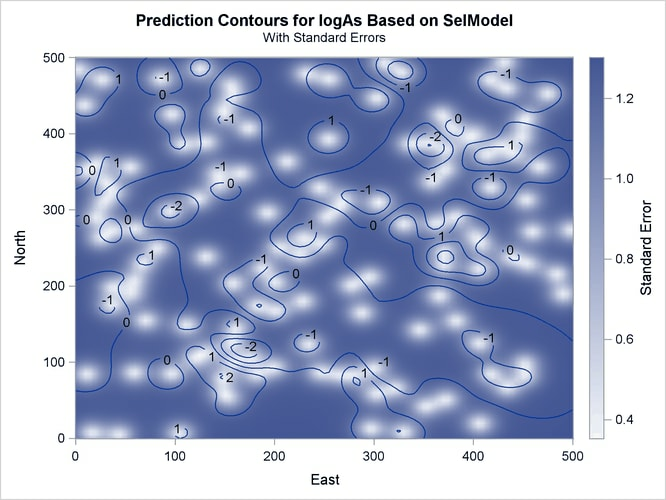 For prediction of the logAs values in the specified area, assume a rectangular grid of nodes with an equal spacing of 5 km between neighboring nodes in the north and east directions. This produces a total of prediction locations. In the KRIGE2D procedure you specify the name of the item store you want to use for prediction input in the IN= option of the RESTORE statement. You request use of the selected model for prediction by specifying the STORESELECT option in the MODEL statement. PROC KRIGE2D produces a table with general information about the input item store identity, as shown in Output 49.1.1. The second table in Output 49.1.2 itemizes the variables in the item store and displays the sample mean and standard deviation of their data set of origin. Hence, the values shown in Output 49.1.2 refer to the observations in the logAsData data set. 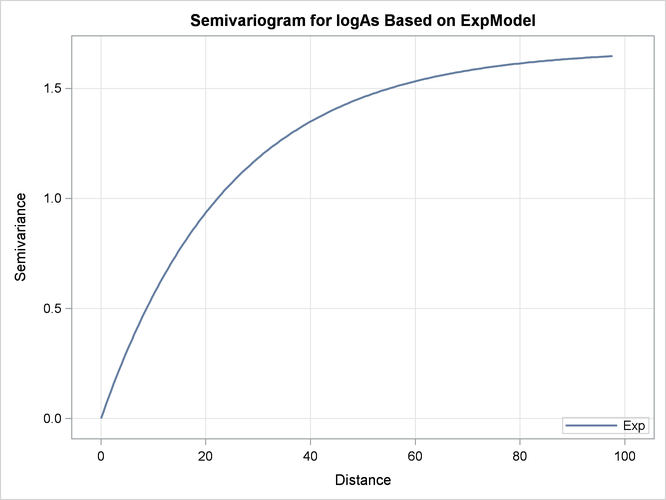 The table in Output 49.1.3 presents all the correlation models fitted to the arsenic logarithm logAs empirical semivariance that are saved in the SemivAsStore item store. According to Output 49.1.3, the Gaussian-Gaussian model is the selected model for the empirical semivariance fit based on the specific weighted least squares fit and ranking criteria. In the section Aspects of Semivariogram Model Fitting in the VARIOGRAM procedure, it is noted that all fitted models in the first five equivalence classes produce very similar semivariograms, and this is likely to lead to similar results in prediction analysis. For comparison purposes, you choose to examine the selected model, in addition to the exponential model in the SemivAsStore item store. As shown in Output 49.1.3, the exponential model is one of the least well-fit models based on the criteria used for the specific fit. You are interested in comparing the predictions from each one of these two models, and you examine their impact on your analysis. The default item store model selection is the model on top of the list in Output 49.1.3. Hence, you specify the STORESELECT option in the MODEL statement without any suboptions, and it invokes the Gaussian-Gaussian model from the SemivAsStore item store. You assign the label SELMODEL to the corresponding MODEL statement. You also specify a second MODEL statement with the label EXPMODEL to request prediction based on the exponential correlation form. In this case you specify the STORESELECT(MODEL=) option in the MODEL statement to request the desired form. You omit the INFO option from the RESTORE statement. You specify the PRED and the SEMIVAR options in the PLOTS option of the PROC KRIGE2D statement to produce plots of the predicted values and the semivariance model, respectively, for each MODEL statement. You request that the prediction output be saved in the Pred output data set. When you run these statements, in addition to the input item store information table, PROC KRIGE2D also produces the number of observations table and general kriging process information, as shown in Output 49.1.4. PROC KRIGE2D first uses the Gaussian-Gaussian model. The table in Output 49.1.5 shows the saved parameter values of the fitted Gaussian-Gaussian model in the SemivAsStore item store. PROC KRIGE2D uses these parameters for the prediction based on the selected model. The semivariogram of the Gaussian-Gaussian model with the parameters shown in Output 49.1.5 is depicted in Output 49.1.6. Output 49.1.7 is a map of the kriging prediction of the arsenic concentration values logAs in the specified domain. 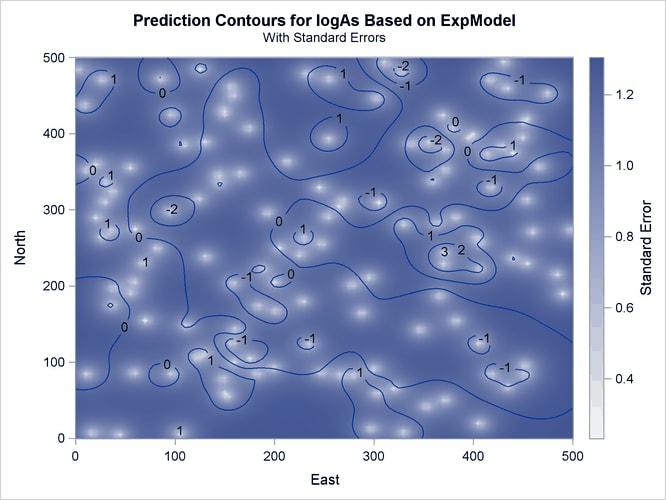 The prediction error surface shows a naturally increasing error as you move farther away from the observation locations. Interestingly, kriging predicts a small area of increased arsenic concentration values located in the central-eastern part of the domain. The WHO threshold of 10 g/lt for the maximum allowed arsenic concentration in water translates into about 2.3 in the log scale, and the particular area exhibits values in excess of 3. Due to the suggested violation of the WHO standard, this particular area is very likely to be the focus of further environmental risk analysis. Next, PROC KRIGE2D performs prediction with the exponential model. The model parameters are also read from the SemivAsStore item store and are shown in Output 49.1.8. Output 49.1.9 illustrates the semivariogram of the nested exponential model where its parameter values are those shown in Output 49.1.8. The prediction plot for the exponential model is shown in Output 49.1.10. Prediction values and spatial patterns are similar overall to those of the Gaussian-Gaussian case. Clearly, although both models predict the same basic characteristics for the arsenic logarithm concentration distribution, the exponential model suggests a more limited spatial variability in closely neighboring locations. The lack of a nugget effect in the exponential model justifies this behavior. Also, the exponential model predictions seem less inclined to deviate farther away from the near-zero mean than the Gaussian-Gaussian model predictions.The prediction error reaches about the same upper values for both models, though its low values are slightly smaller in the exponential model. The Gaussian-Gaussian model prediction produces the result in Output 49.1.11. The analysis suggests a minimal occurrence of excessive arsenic concentration in drinking water in about 0.43% of the study region. The exponential model predicts that the WHO arsenic concentration threshold is exceeded in about 0.27% of the domain, as shown in Output 49.1.12. Although this is still a minimal occurrence of the threshold violation across the region, the exponential model estimates the impact to be at about two thirds of the Gaussian-Gaussian model percentage. The results in Output 49.1.11 and Output 49.1.12 suggest that it might not be possible to provide a unique answer about the area percentage that is affected by increased arsenic concentration. You chose to examine two different correlation models whose performance is relatively similar, and they provide impact estimates that differ by about 37%. You might conclude that the answer to the initial question about the percentage value lies in the neighborhood of the results given by the two correlation models. Further analysis with more models is necessary to validate this assumption. It is important to note that apart from the continuity model choice, additional factors contribute to this investigation. Such factors could be the use of local instead of global kriging, or even going back to the empirical semivariogram computation stage and repeating the analysis for different possible spatial continuity empirical estimates. A sensible approach to tackle this analysis would be to investigate the range of the impact suggested by all candidate correlation models and to proceed by defining the best and worst case scenarios for the size of the affected area. Eventually, when it comes to using your findings, it is important to account for the subjective nature of stochastic analysis and multiple possible answers to your questions. In that sense, some scientific questions might be more sensible than others to interpret your results correctly. For instance, you might want to investigate only whether the adversely affected domain percentage is below 1%, rather than attempting to provide a specific value for it. Then, you might consider the preceding findings sufficient, despite any fluctuations in the estimated percentage. In a different scenario, the areas with high pollutant concentration could be populated. Hence, any local health standard violation is probably unacceptable, and it can be crucial that you provide solid and more detailed assessment in that case. The section Risk Analysis with Simulation in the SIM2D procedure investigates a different aspect of this study and offers additional perspective about spatial analysis.